Murals are like people: they age. After years of exposure to the elements, they pucker up and fade. Sometimes it's just dust and grime. Other times, the paint peels, or cracks appear and entire chunks disappear, erasing people and symbols from the story. Precita Eyes Muralists is a leading steward of mural restoration in the Mission district and around San Francisco. "Preserving these cultural assets is central to our mission," says Susan Cervantes, founder and director of the 40-year-old mural arts center. "And there are so many older community murals that need attention." 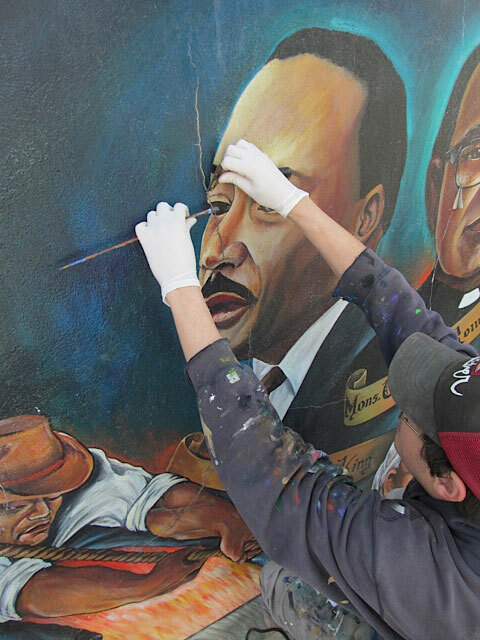 In fact, a recent 2016 assessment conducted by Precita Eyes in the Calle 24 Latino Cultural Corridor determined that half of the 100 murals surveyed are in "poor" to "fair" condition. It doesn't take an expert eye to notice: local residents often contact Precita Eyes to point out murals in need of tender loving care. ​SAVING FACE: Detail from the restoration of "500 Years of Resistance," St. Peter’s Parish at 24th St. and Florida. The mural was created in the mid-1990s by Salvadoran muralist Isaias Mata, and restored by the artist in 2012. * Mission Health Center (2016): Created in the 1970s by Michael Rios and Graciela Carrillo, the murals are located at 240 Shotwell St.
* "Sí Se Puede" (2014): Created in 1995 at the Cesar Chavez Elementary School (825 Shotwell St.).